The setting: Outdoors in my Mom’s yard in June. The weather was perfect, although it did rain (well, more-like sprinkle) briefly. 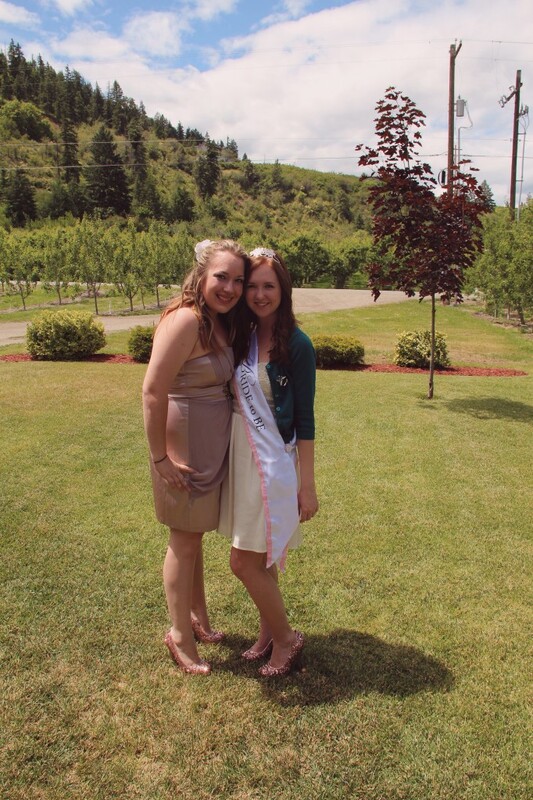 That was fine with me though- I heard that if it rains at your bridal shower it’s good luck! 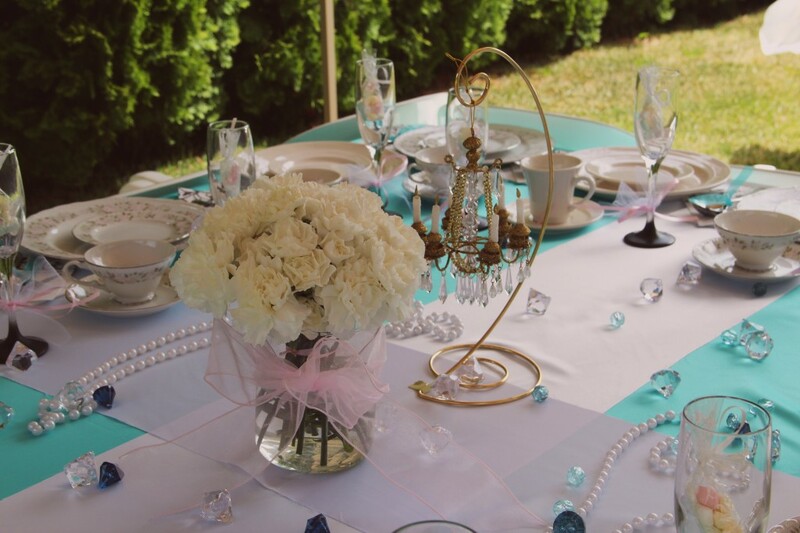 We set up a table underneath an outdoor tent, and my sister-in-law made it look stunning. 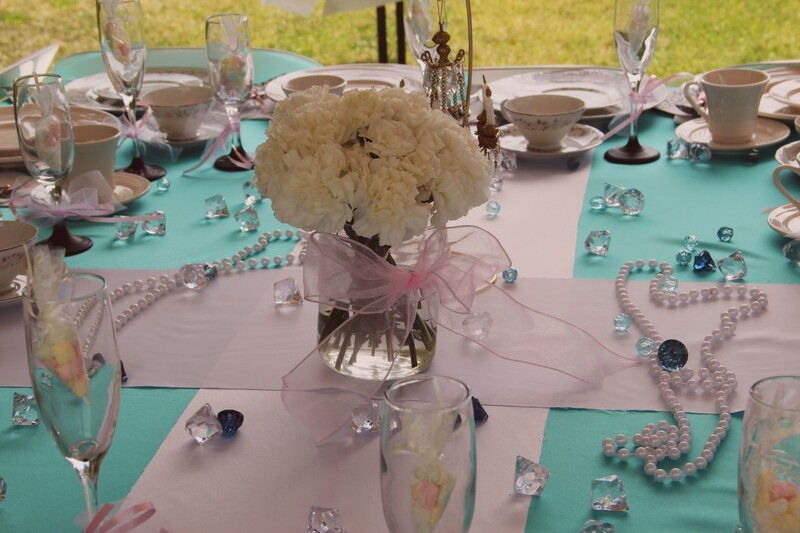 She made a Tiffany blue table cloth with white runners, so that the table looked like a Tiffany box! Perfection! 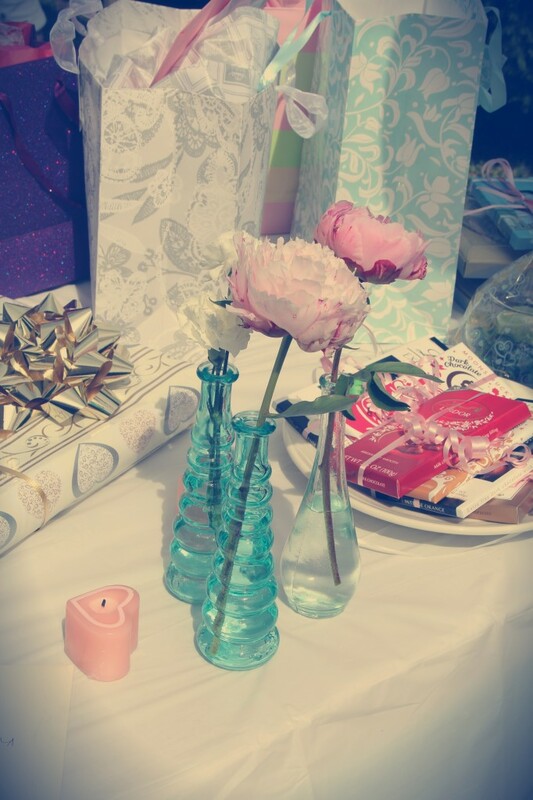 And, the china we used was her shower gift to me! 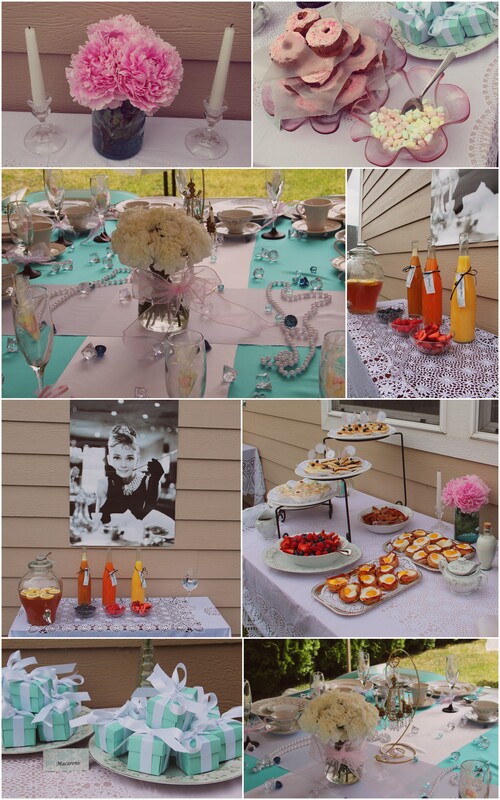 The champagne flutes shown in the pictures were one of the favors. 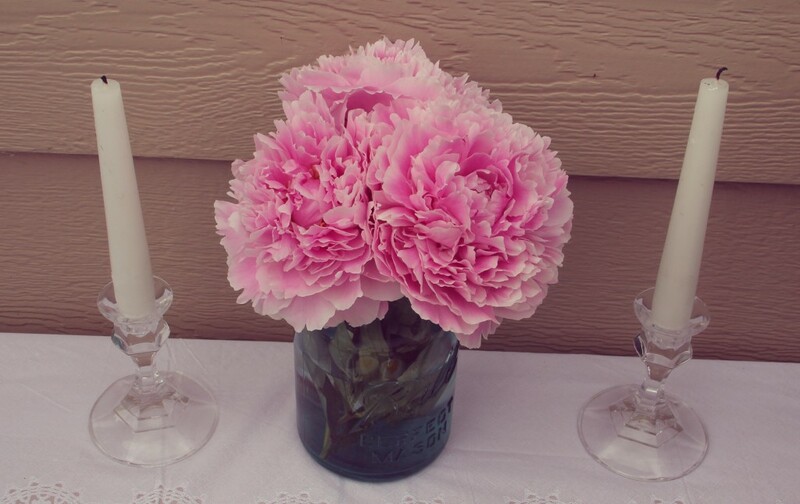 We spray painted the bottom with chalk paint and wrote the guest’s name on the bottom to serve as place cards. We put after dinner mints in the flute as well. They got to take the glasses home with them. Food always seems to be a key part of my planned gatherings. A menu really says a lot about an event! 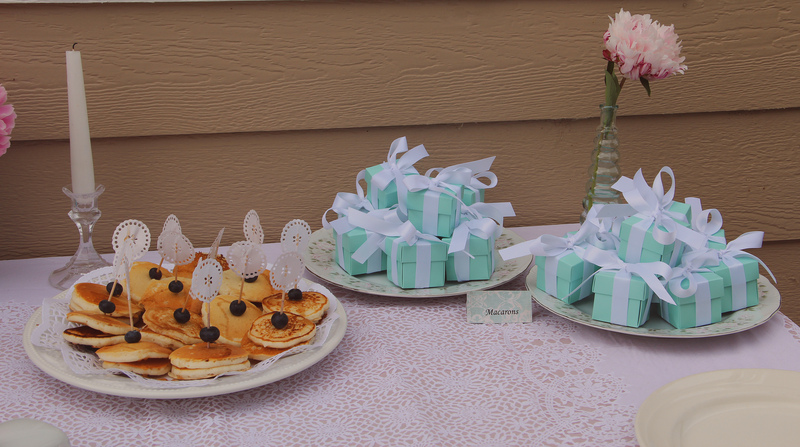 Since my bridal shower was a brunch, planning the menu was really fun. I love brunch! Who doesn’t, though? 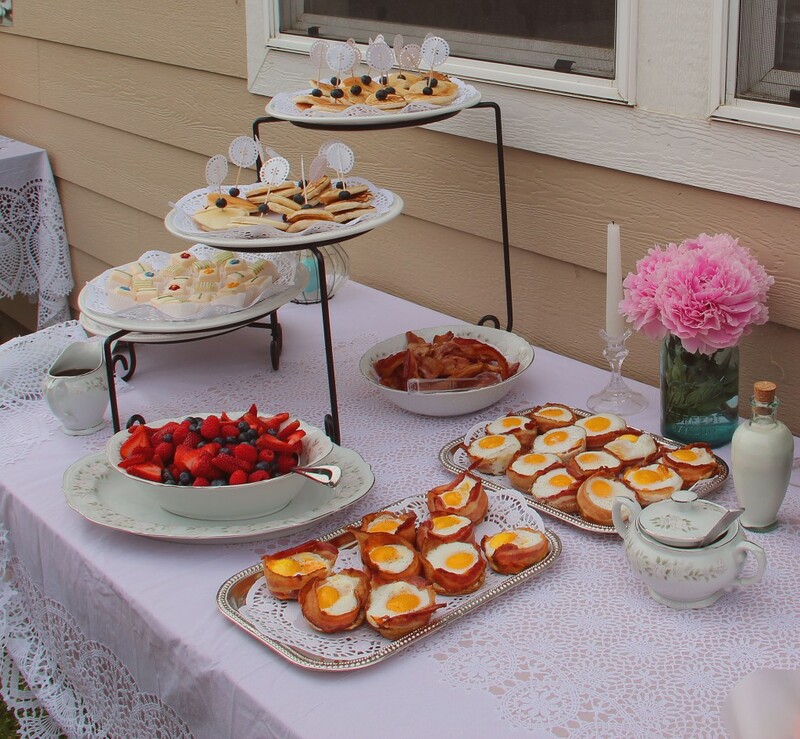 Here’s what we had: Fruit tarts, mini pancake skewers, petit fours, fresh fruit, bacon & egg cups with toast, and frosted cake doughnuts. 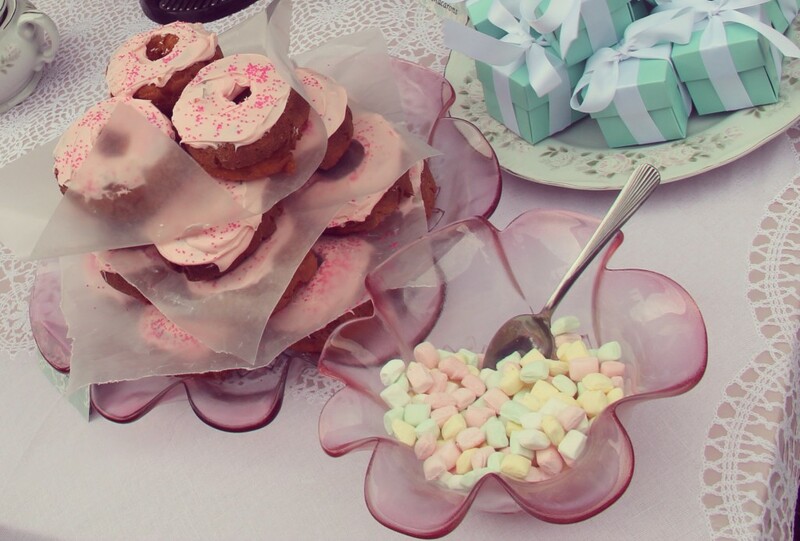 We made a doughnut tower which was one of my favorite parts of the brunch. The cake doughnuts were purchased from a local bakery, which we frosted ourselves with pink frosting and added pink sprinkles. They were delicious. 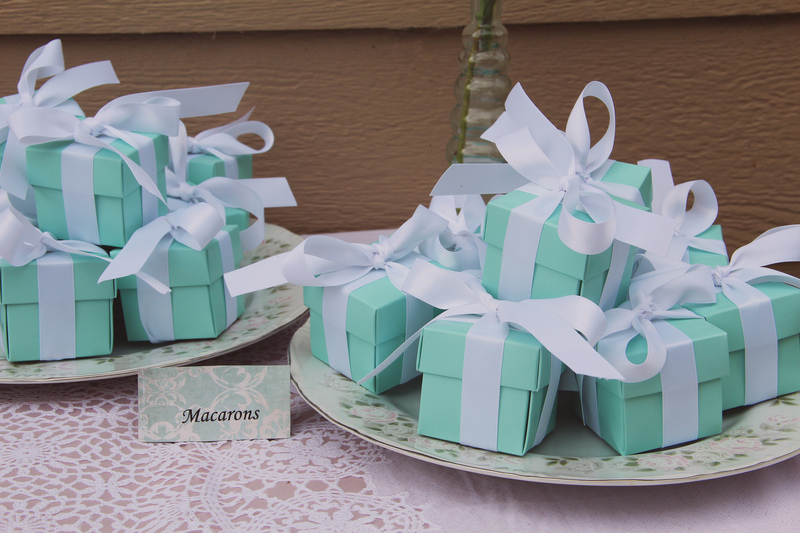 The Tiffany blue gift boxes shown below have macarons in them. 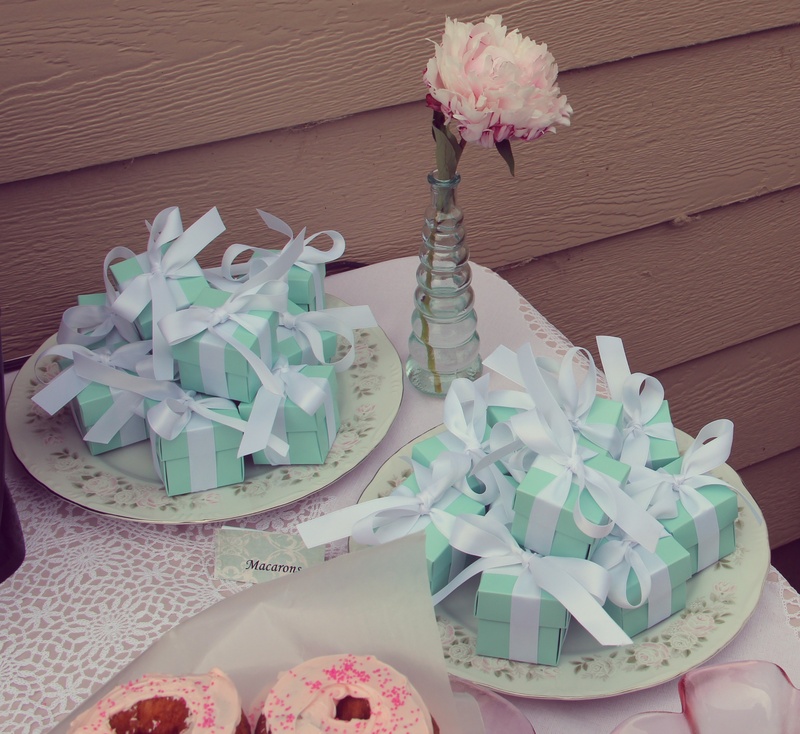 They were another of the party favors for guests to take with them. 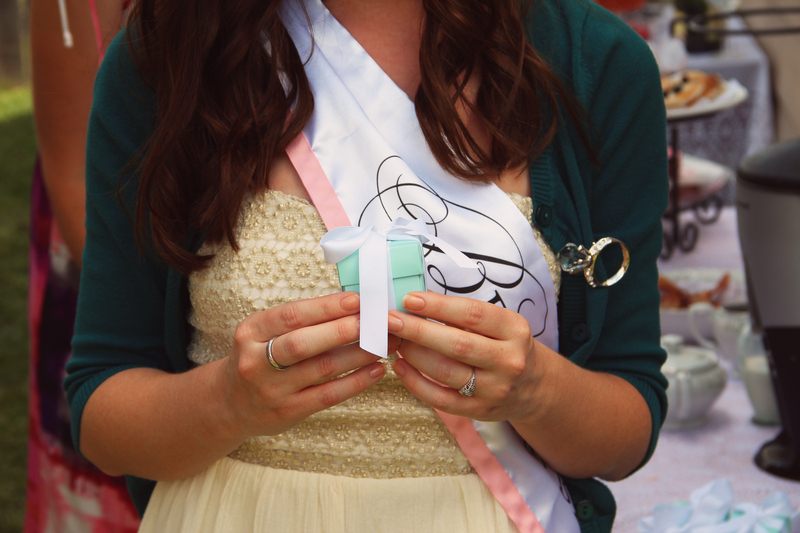 The flavors we purchased for the event were salted caramel and rose. 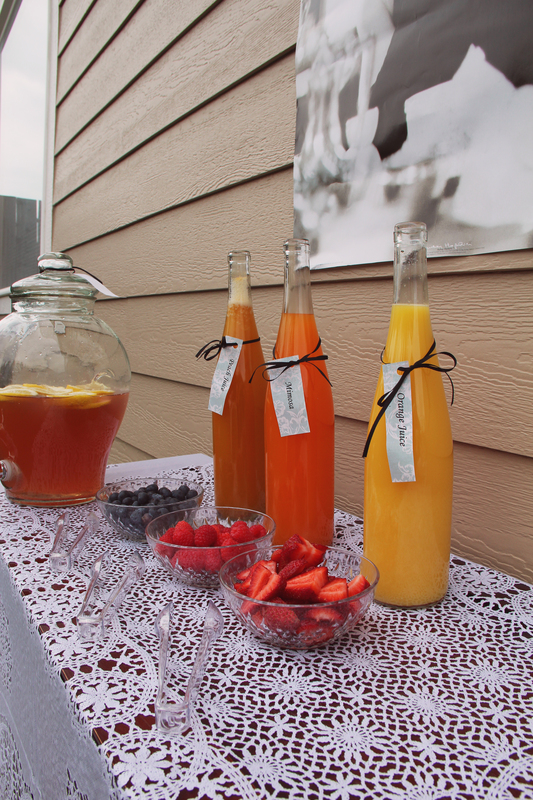 One of my favorite parts of the brunch was the mimosa bar! It turned out even better than I had imagined. 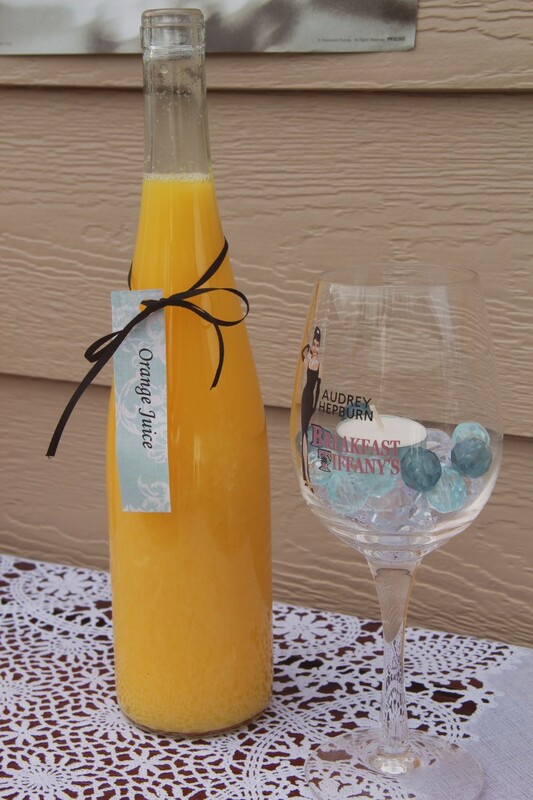 We had lots of champagne, orange juice, tropical V8 Splash, and peach juice for bellinis. We also had various berries for garnish. Aside from the mimosa options we had sparkling pink lemonade, bottled water and coffee. We played four games throughout the shower. The first was the game where nobody can say the groom’s name, wedding or marry (in any form.) 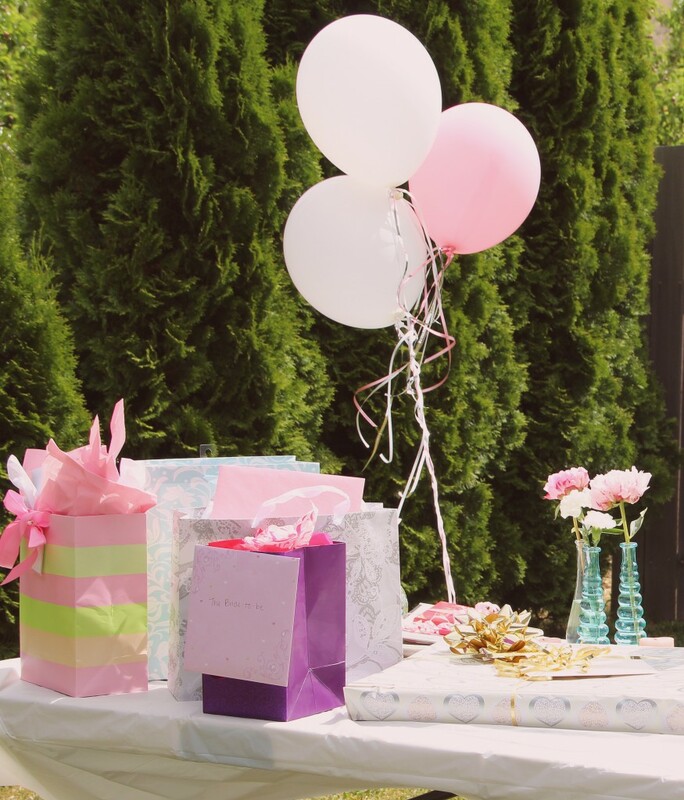 Each guest was given a pink ribbon to wear upon arrival, which could be stolen from them if they were caught saying one of the words mentioned above. 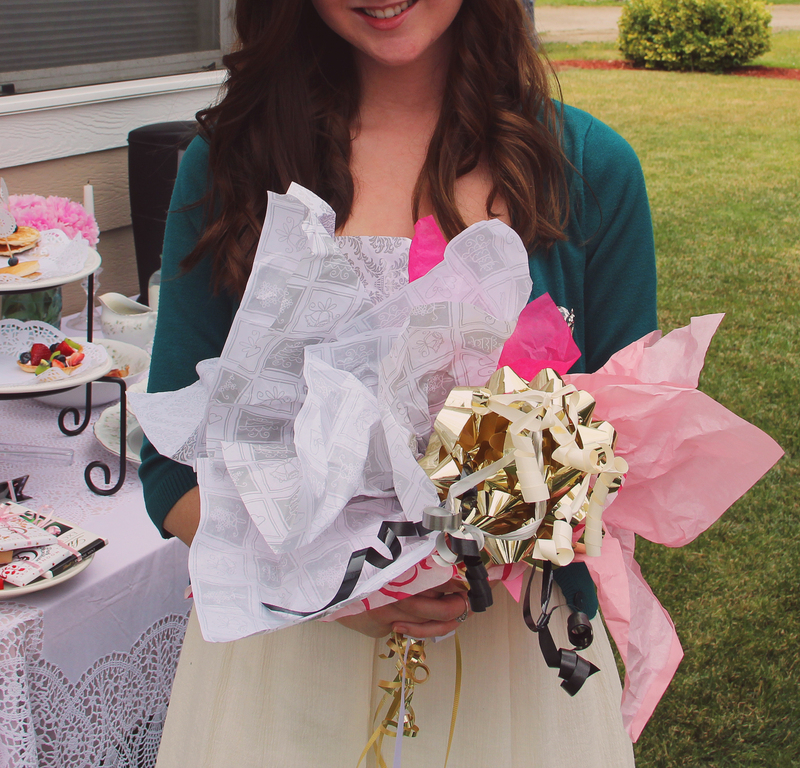 Whoever had the most ribbons at the end, won a prize. 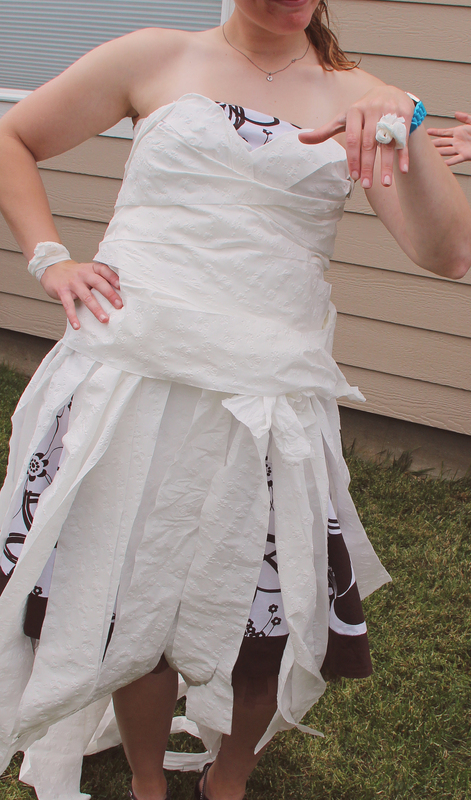 The next game was the purse game, where one of my bridesmaids compiled a list of items she read off, seeing who had the most items in their purse. This one is a favorite of mine! Here is a link to my old post. The pictures are much smaller, but I did go into a little bit more detail about the event if you would like more information. 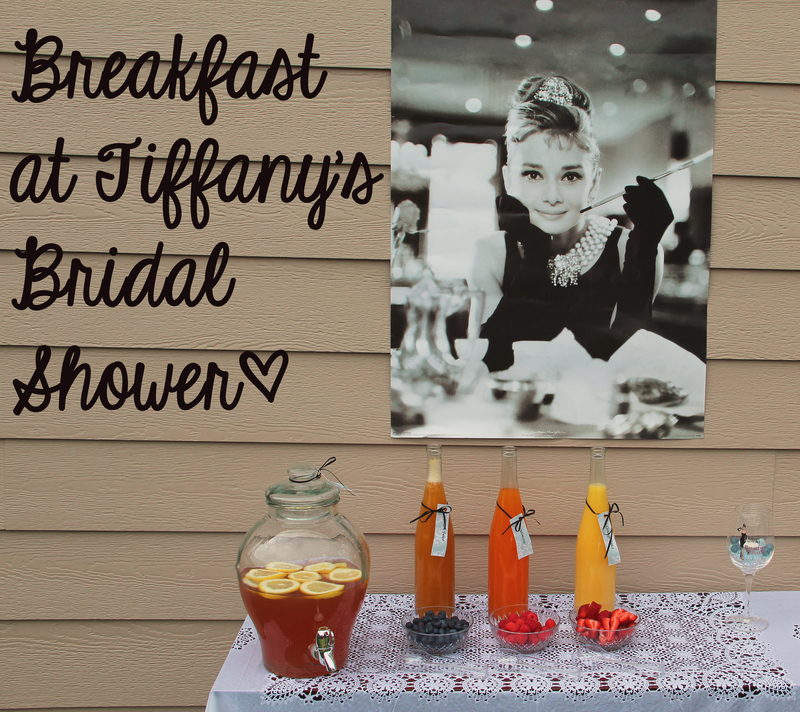 I hope this can provide inspiration to anyone looking to have a bridal shower brunch! P.S. A lot of my inspiration came from Eat Drink Pretty! 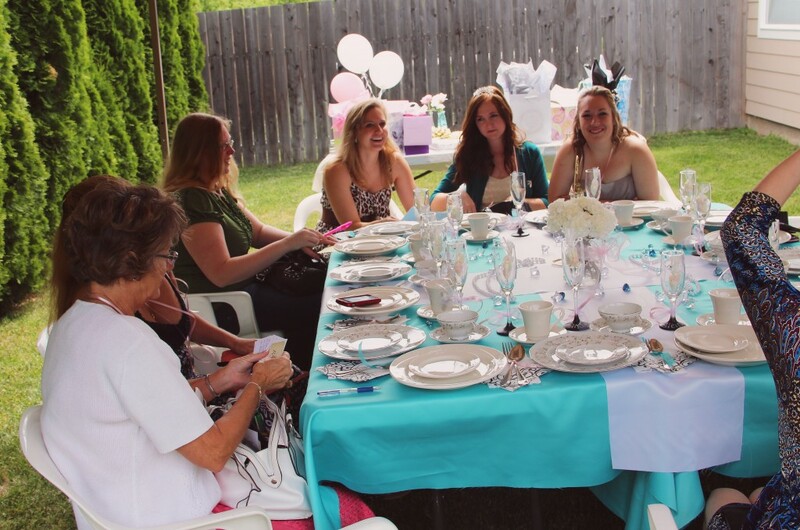 Oh my gosh, the bridal shower Jenna hosted for her sister was stunning! If you haven’t seen it yet, you have to check it out! Here’s the link! Love this Kayla…. 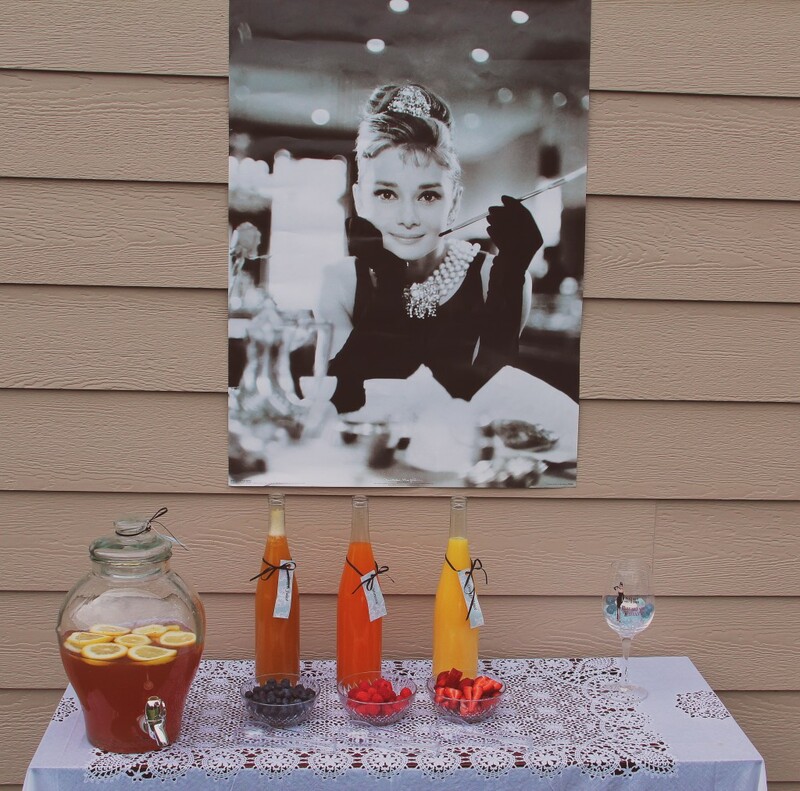 I saw this post and thought OMG, this would be PERFECT idea for my bridal shower in the spring……. As I was reading and looking at your pictures…… I was like….I know that girl!!!! Love love love!!!!! -Tiffany Briggs!!! Oh my gosh, haha, thanks Tiffany! Love it! Congrats by the way:) That is so exciting! It was really fun to put together– definitely check out Eat Drink Pretty’s page too if you are looking for inspiration… it’s where I got a lot of mine!